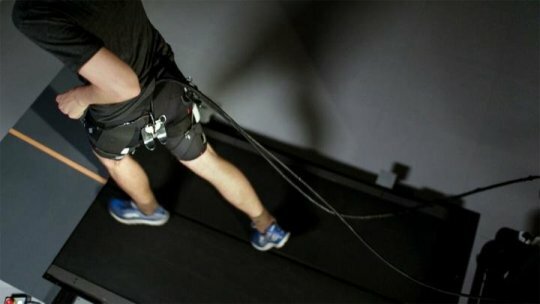 A team of scientists led by Wyss Postdoctoral Fellow Giuk Lee, Ph.D. studied an improved tethered soft exosuit developed in the lab of Wyss Core Faculty member Conor Walsh, Ph.D. that is used to reduce the metabolic cost of running.The team tested two different patterns of wire pulling or profiles to assist the subject in running on the treadmill. One was based on the human biology which applies force at the point of maximum hip extension observed in normal running while the other was based on the simulation of exoskeleton-assisted running which applied force slightly later in the running stride. They found out that the profile based on the exoskeleton-assisted simulation was more effective in reducing the metabolic cost in contrast to the profile based on the human biology. They also analyzed the effect of actuating wires assisting the hip joints to other joints of the body and found that knee extension and forces between the foot and the ground were affected through simulation-based profiles and not affected through biology-based profiles.Despite the results, further biomechanical analyses are required to confirm the suggestions that simulation-based assistance profile is responsible for the reduction in metabolic cost. The team hopes that the metabolic cost of running can be further reduced in the future. Want to know more about this awesome technology? Follow this link!